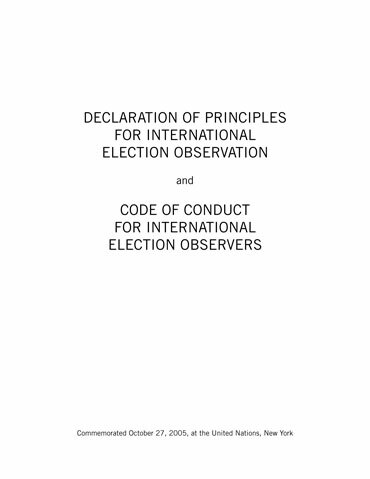 The Declaration of Principles for International Election Observation and the Code of Conduct for International Election Observers establish the basis for credible international election observation. The Declaration was developed through a multi-year process involving more than 20 intergovernmental and international nongovernmental organizations concerned with election observation around the world. The process began informally in 2001 at the initiative of National Democratic Institute (NDI) and the UN Electoral Assistance Division (UNEAD). The declaration was commemorated at the UN on 27 October 2005, and is endorsed by 55 intergovernmental and international organizations which are engaged in the process of improving international election observation. Translations of the Declaration and the Code of Conduct can be found on the website of the NDI.